Video games have done far more than change the way we entertain ourselves. They have changed how we communicate, how much time we spend with friends and family, and how much time we invest in active, real-life pursuits. The debate over the positives and negatives of video games rages on. While some argue that gaming after a long day at work or school is innocent fun, others believe video games hinder social interaction, academic and work performance, and the ability to integrate fully into real life. Research published in the Journal of Youth and Adolescence links young people’s use of video games to poorer relationships with friends and family. The study, by Brigham Young University undergrad Alex Jensen and his faculty mentor, Laura Walker, was based on information collected from 813 college students. The more time students spent playing video games, the worse their relationships with peers and parents got. Study participants recorded the amount of time they spent playing video games, and also answered questions regarding relationship quality, such as how much time, trust, support, and affection they share with friends and parents. Young adults who spend a lot of time playing video games are more likely to be involved in risky behaviors like drinking and drug abuse. Young adults who played video games daily reported smoking pot almost twice as often as occasional players, and three times as often as those who never play. Young women who spent a significant amount of time playing video games had low self-worth. 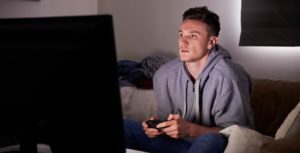 Since nearly three-fourths of college-aged men in the study played video games regularly, and only 17 percent of their female counterparts played more than once a month, Jensen also questioned the impact of video games on romantic relationships. “The gender imbalance begs the question of whether chasing a new online victory beats spending quality time with a girlfriend or wife,” Jensen said in the ScienceDaily article. Make gaming a weekend activity, or limit your “screen time” to an hour a night. Stay active in hobbies you’ve always enjoyed, or try a new sport, volunteer activity, or extracurricular pursuit. Make real-life relationships a priority. Even though the virtual fantasy world can be enticing, schedule time with friends, family, and loved ones regularly. In order to protect and preserve your romantic relationship, reserve some quality time each day for your spouse or significant other, and play video games when she’s asleep or doing her own thing. If your partner has any interest in video games, introduce her to your virtual world and explore the world of gaming together. That way, you’re blending video game play with time spent together. Always remember that no matter how deep your passion for gaming, your relationship comes first. If gaming is interfering with your relationship, chances are it’s in your best interests to curb the habit anyway. If video games are damaging your personal relationships or otherwise negatively impacting your life, know that help is available. For teens and young adults, wilderness therapy programs are an excellent way to break free from technology for a while and reconnect with nature, family, and yourself. There are also a variety of 12-step programs and addiction treatment centers that have developed specialties in video game addiction and internet addiction. As alluring as the virtual world can be, nothing can replace the joy and satisfaction that come from nurturing close personal bonds with those most important to you.